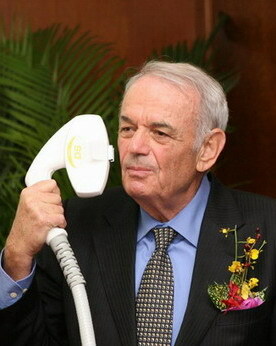 BEIJING - Shimon Eckhouse is co-founder and chairman of a list of companies including Syneron, CardioDex, NanoCyte and Tulip. Shimon Eckhouse, co-founder and chairman of a list of companies including Syneron, CardioDex, NanoCyte and Tulip. All of them are concerned with the aesthetic medical business. In addition to entrepreneurship, Eckhouse is the inventor of intense pulsed light (IPL), a technology used extensively for non-invasive aesthetic medical applications and also known as photorejuvenation. It's difficult to guess the age of this Israeli. His white hair and rich experience in the medical beauty sector indicate he should be in his 60s or 70s, but the well-kept figure and tight skin suggest he might be middle-aged. Eckhouse told China Daily that the industry developed a lot during the last few decades and it is now "safer, easier and more affordable". Plastic surgery was the most common treatment in the 1980s and 90s in the developed market to eliminate wrinkles and reduce body fat. Thanks to the development of IPL and laser technologies, non-invasive applications are now more popular because they are less painful and cheaper. Meanwhile, safety has become the biggest concern, adding to the appeal of non-invasive surgery, according to Eckhouse. Customers have become smarter. They pursue beauty while demanding safety and high cost-effectiveness. As their lives get busier, they also hope to spend less time becoming or staying beautiful in the easiest way possible. Dong Pingling, who underwent liposuction on her stomach fat in the late 1990s, said that she, then aged 41, spent half a day at the surgery and stayed at home for about half a month. "I can still remember the pain which cannot be exactly described," she said. She underwent the procedure in an army hospital at a cost of 5,000 yuan ($752), the same sum as her monthly salary at the time. Now, thanks to non-invasive technologies, matters are far different. Dong's daughter, 25, said she plans to undergo laser treatment on her thighs. "The treatment involves three courses - no more than one hour each for three weeks - and costs 1,500 yuan, without leaving a wound," she said. The gap between China and developed markets, such as the United States and Japan, in the aesthetic medical sector is narrowing fast, as the emerging market develops dramatically, according to Wang Zhijun, vice-director of the medical aesthetic and beauty committee under the China Medical Association. Statistics from the World Fact Book conducted by the World Bank show aesthetic medical sales in Asia amounted to $38.89 billion last year, with 16.76 percent, or $6.51 billion, contributed by China. The booming market, driven by the nation's increased individual income, improvements in people's living standards and large population base, is attracting more businesses. Eckhouse's Syneron is one of them. Syneron is engaged in developing and producing medical aesthetic medical devices and medical beauty. It entered China in 2008 via a joint venture in Beijing and now has five facilities nationwide. At the beginning of this year, Syneron acquired Candela, the United States' biggest medical laser company, to become the world's largest medical aesthetic devices and services provider. The new company now has more than 30 percent of the global market with annual sales of $200 million. "We realized two-digit growth globally, and if our business in China grows much faster, we will become the largest one (in the medical aesthetic industry) here," said Eckhouse.